Details Of Paul Weller Aftershow Party In Derby! – Paul Weller News! 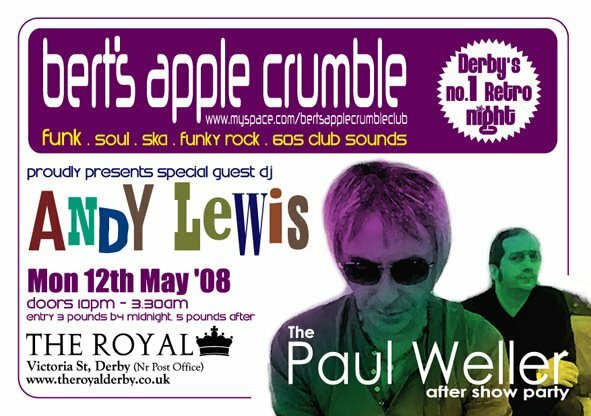 Details Of Paul Weller Aftershow Party In Derby! To make it extra special we’ve invited some very special guests to join you, and will be welcoming ANDY LEWIS back to the club to spin some tunes for you. Andy last played Bert’s in October last year, whilst charting in the UK with his Acid Jazz single with Mr Weller, titled ‘Are You Trying To Be Lonely?’. Since that time Andy’s kept in close contact with Paul Weller, in fact he’s now part of the band. All details on nearby parking, hotels, future club dates, music policy, etc. can be found on our web page. Previous Entry Win Tickets To See Paul Weller At The Teenage Cancer Trust Concert! Next Entry Paul Weller Designs A Brand New Ltd. Fred Perry Shirt!